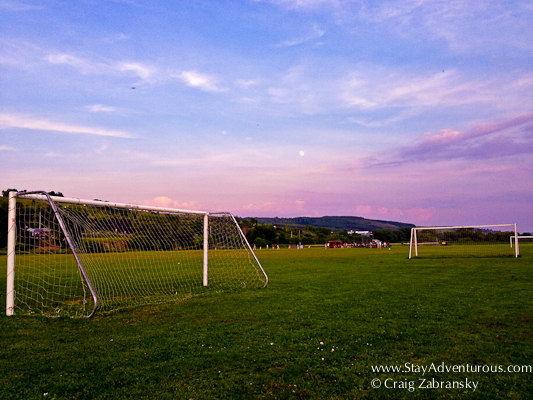 Returning from a road trip, I pulled off Interstate 81 in the small town of Marathon, New York for some fuel, dinner and what else… a sunset. The small town was nothing like the New York City Marathon being held this Sunday. Marathon Sunday in New York City is one of my favorite days of the year. After watching the marathon one year I learned all about the true joy of the New York Marathon and that’s why I return every year to cheer for strangers and friends alike. Plus, there is also always the marathon sunset in Central Park. A far different scene, Marathon, New York has a population of just under two thousand people. And after dinner and refueling at the gas station, I decided to stretch my legs at the local park and watch the sunset. With summer weather, the playground was filled with active kids and organized sports (baseball). Hmm… Well, it seems after my time in Buffalo, New York and now this little snapshot of Marathon, New York at sunset, I am starting to see more of New York and truly Love All of New York. Happy Sunset Sunday. All the best to all the runners who participated in the marathon and also for all those who cheer them on and support their effort. Yes, all of New York is… I am starting to appreciate more and more of it besides just the city… Although make no mistake I love NYC.